Package Includes - 13 kinds of jewelry making tools (Details in the product description). 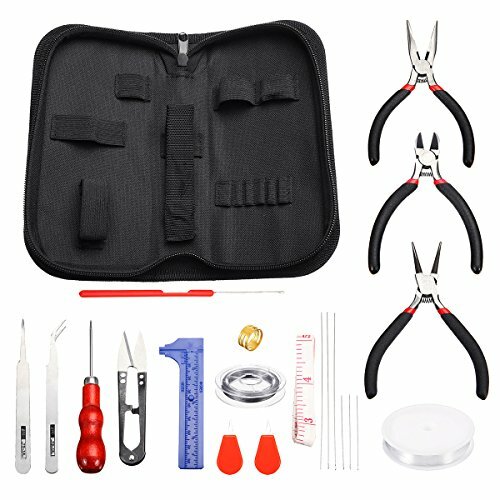 Effective and safe for use: this jewelry repair kit makes jewelry making and repair easy and smooth. It is perfect for either professional or just amateur jewelry making lovers to do their jewelry making project, jewelry beading project, jewelry repair and other DIY projects. 3 Pcs Pliers and 2 Pcs Tweezer - Equipped with 3 Pcs pliers and 1 Pcs tweezer. The production process will be convenient,the effect more beautiful. It is very suitable for beginners. Different tweezers can be designed and made a variety of jewelry. NOTE: We put a layer of oil on the pliers to prevent the pliers from rusting. Please be careful with your clothes and furnishings. Zipper Storage Case - The package comes with a zipper storage case. It makes jewelry making tools neat and not messy. It is perfect for either professional or just amateur jewelry making lovers to do their jewelry making project, jewelry beading project, jewelry repair and other DIY projects. After-sale Service - If you find any question about jewellery making tool kit, please contact us immediately. We will provide you a satisfactory answer and one of the quickest solutions.